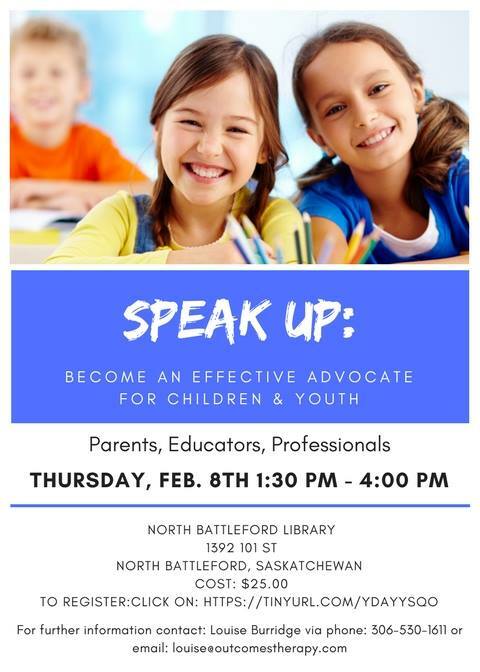 Our Speak Up: Become an Effective Advocate for Children and Youth Workshop is coming to North Battleford on Thursday, February 8th, 2018. • Where to access additional supports. This workshop is co-facilitated by Elaine Caswell and Louise Burridge. LOUISE BURRIDGE is a passionate occupational therapist who has been practicing for over 17 years in school, childcare, home and hospital settings. She is a dynamic speaker and therapist who strives to ensure each participant leaves her workshops with practical, user-friendly strategies that are tailored and effective for all participants. ELAINE CASWELL has worked as a teacher, superintendent, deputy director and director of education within school boards and an an advisor to government. Elaine’s mission is to “improving student achievement, increased collaboration with educational partners, and focused professional development to support teachers in reading instruction”. *Tickets for this workshop are $25.00. This entry was posted in Speak Up! and tagged school, speak up.